“Monolith was founded in October, 1994, in Kirkland, Washington, by a small group of individuals with an extensive history in the computer and educational games market. While still developers at Edmark, Monolith's founders decided to enter the fiercely competitive European 'demo' scene with a Windows-based prototype that demonstrated the kind of gaming graphics that, at the time, were believed possible only by using DOS. This demo caught the eye of Microsoft Corporation, with whom the Monolith founders worked on an early version of what became the LithTech Development System. During these formative years, Monolith included both a publishing division as well as internal development teams. The company later reorganized and focused exclusively on game development. By strengthening its internal management structure, hiring experienced developers, and focusing on timely delivery of quality product, the company strengthened its external partnerships and slowly built a solid reputation as a dependable development house. During this phase, the company grew to over 80 employees and three teams. But don’t let the PR droids speak for them. If you care to peruse their game history you will come across a few titles that you’ve probably heard of before: Blood and Blood II, their original FPS titles; No-One Lives Forever, No-One Lives Forever 2, and Contract: Jack, a three-part series that is a cross between James Bond and Austin Powers; the underwear-staining Alien versus Predator 2; the under exposed and underrated Tron 2.0, a game based on the 1980s film of the same name; The Matrix Online; and of course, F.E.A.R. With such an impressive list of titles under their belt you’d expect Monolith to be able to bring the goods with their latest addition to the FPS genre, and no doubt, for those of you who are fans of Monolith’s previous works, F.E.A.R is no disappointment. Indeed, it’s impressive even if you aren’t a fan of their previous work. The installation procedure for F.E.A.R is like any other software title: pop the DVD in your drive and away you go! Using my Lite-On DVD/CDRW combo drive, I experienced no troubles at all installing the game. As it sits now on my hard drive, with the latest patch applied, the game is using approximately 4.62Gb of storage space. They certainly didn’t waste any resources when pressing the DVD. Those of you who choose to install using a DVD-R/RW may find later on that you have many a great difficulty trying to actually play the game, but I’ll cover this toward the end of the article. After F.E.A.R is installed, you can choose to update it to the latest version by simply installing the patch, and then you can get to playing. After you skip through a few (read: four) annoying start-up screens you’re presented with the menu system. It’s quite pretty with videos constantly looping in the background, and I feel the music played really sets the tone of the game well. Navigation of the menus is simple and intuitive. One nice feature that Monolith included was an auto-detect settings feature, which is nice because it actually seems to do a fairly accurate job. My system is based around an S754 Athlon64 3400+, 1024Mb of DDR400 memory and an Albatron 6800GT 256Mb. The auto-detect feature detected my system as having the majority of options set to “maximum”, which plays well. When you enter the game for the first time, you’ll see the HUD is not unlike others you’ve seen before. There are the standard bits and pieces floating around detailing your current health and armor, what gun you have selected and its remaining ammunition and your SlowMo meter. Other parts of the HUD become visible when they’re active; for example the flashlight charge meter, and the small icon indicating an active comm-link between yourself and the NPCs. 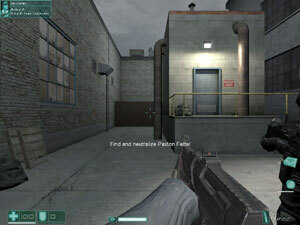 The control system is also very similar to any typical FPS: mouselook and the WSAD keys are used to great effectiveness. However, due to the gameplay elements of F.E.A.R, there are extra key mappings that need to be considered. This is where I come to a slight gripe with Monolith. Toggling weapon Zoom is by default assigned to the right-shift key, which is fine if that’s the key you want to use. SlowMo is by default assigned to the left-Control key. Crouch is by default assigned to the C key. Now, ever since I started playing FPS titles back in the day, I’ve always wondered why anyone would want to use C for crouch. C isn’t for crouch. If you’re in an intense firefight, you’re crouching and trying to avoid enemy fire, you can’t move right at all. Of all the gamers I’ve seen who use the WSAD key layout, the index finger falls on D, the middle finger W and S, and the left finger A. This leaves your thumb for Space (typically jump) and your pinkie finger for left-Shift and left-Control. Depending on the game you’d probably want to assign left-Shift to Run/Sprint and left-Control to Crouch, because if you’ve got C assigned to Crouch, unless you have an extra joint in your thumb you’re going to have a hard time getting to the C key without accidentally pressing something else, most probably Space. Given that Crouching is the opposite of Jumping, I’m betting during the heat of battle you probably wouldn’t want to get these two mixed. Although the key mappings are easily changed via the Options menu I simply don’t see the point in assigning Crouch to C by default. I personally have SlowMo, Melee, Zoom and Fire all bound to buttons on my mouse. If you’re a serious gamer these days it’s more than likely you’ve got a serious mouse with 3+ buttons, and I doubt F.E.A.R’s extra functionality will be a hassle. I won't mention the specific plot here for fear of ruining it for those who are yet to play, though it’s seemingly solid and appears to have had some thought put into it. While the story itself is a little far-fetched, strictly speaking from a reality point of view, it is by no means so out there as to cause any discomfort, or any cringes at bad clichés, or head-scratching as you play through the game. If you’re a fan of The Ring then most likely you’ll be able to pick up parts of its storyline in that of F.E.A.R’s. Though this isn’t necessarily a bad thing, I do find that it’s at least in part unoriginal, thus leading to certain elements of the story being predictable. This unfortunately has a flow-on effect into the game itself where you will find yourself being able to tell when your player will next experience some paranormal phenomenon.